Friday June 16th 1922 Warm day. I did some writing, read and crotcheted. Slept in afternoon. Went up town in evening with Laura to call on Sallie Sheely. Saturday June 17th 1922 I walked over to see Lizzie Duncan and rode back in taxi. The folks busy finishing house cleaning with the kitchen. The girls up town in the evening. Sunday June 18th 1922 I went to church with the girls. Mrs McKee brought us home. I wrote to Hattie, Fannie, The Reed girls, Lizzie Lindley and Carrie Wilson. The girls to church in evening. Monday June 19th 1922 I worked on the shawl. Mr Parsons took me over to see Lizzie Duncan. I found her suffering greatly. I walked home, spent the evening on porch. Tuesday June 20th 1922 I went with the girls in Mr Allens Auto to a park in Pekin to Presbyterian picnic that Will has told me so much about. It was nice to go over the old trail. I enjoyed the day. Evening on the porch. weather fine. 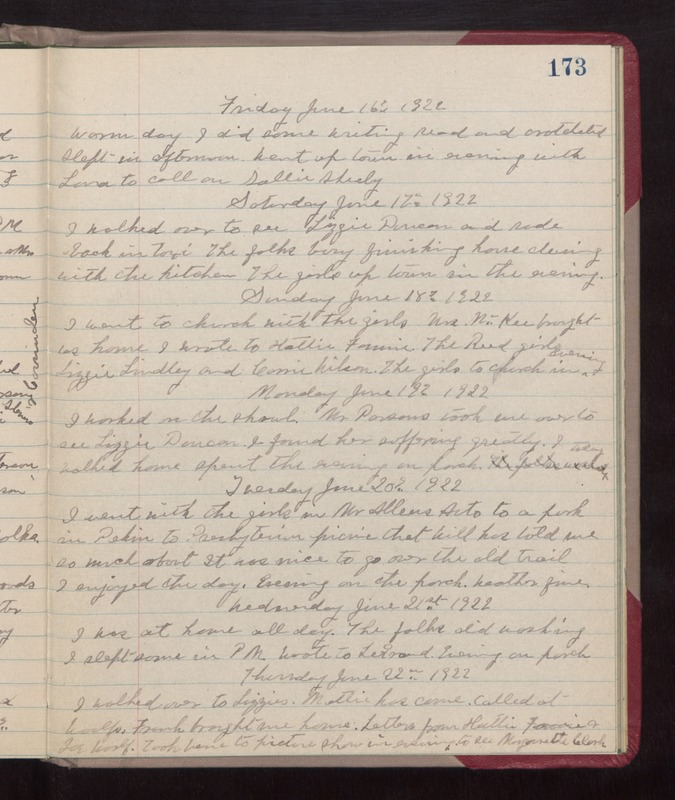 Wednesday June 21st 1922 I was at home all day. The folks did washing. I slept some in PM. Wrote to LeGrand. Evening on porch. Thursday June 22nd 1922 I walked over to Lizzies. Mattie has come. Called at Woolfs. Frank brought me home. Letters from Hattie, Fannie & Joe Woolf. Took Vene to picture show in evening to see Margarette Clark.